It’s time for a little primer on the Proposal process in Cabnetware. We’ll start with a refresher on the procedure. 1) With a room of a saved job open, choose Options Proposal…from the Main menu, or click the Proposal icon on the Report/Output Toolbar. 2) If this is a new proposal you will see a screen similar to this one. 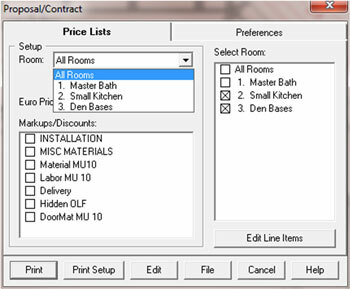 In the Setup Room list box you can select an individual room or All Rooms. The concept here is to select a particular Price list and set of potential Markups/Discounts for the selected rooms. Each room can have a different price list or set of Markups assigned. (Note on the right there is a Select Room list. 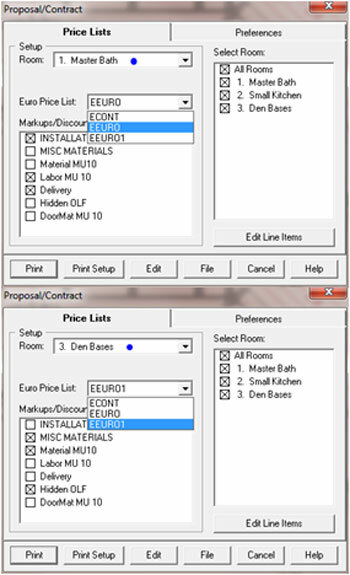 This is a feature new to CW 2011 R2 that allows you to select what rooms you want to include in the proposal). 3) Select the desired Markups/Discounts per room. 4) You can now click on Print or Edit. There is also an Edit Line Items button that will take you to a list of the items in the room. You can add comments, or edit the quantities or price factor on a temporary basis here. 5) The pricing setup is found at File - Setup - Pricing. Choose a Price list and Edit. The price lists contain the names of items the program can produce as well as the Labor cost factor per Linear or Square unit. (Per Each in some cases). 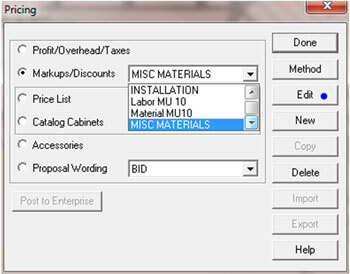 Some items, such as doors, pull the labor cost from each particular file. All the material / hardware costs (including waste) come from the cutting list values. 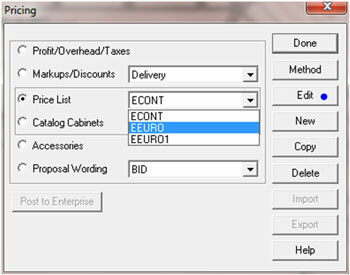 There is an Applicables: column that allows you to select whether a Markup/Discount or Tax is potentially applied to the selected line item. 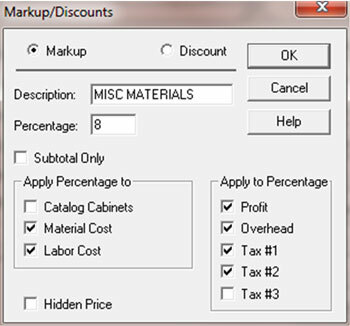 6) The Applicables are set up in the Markups/Discounts part of Pricing. 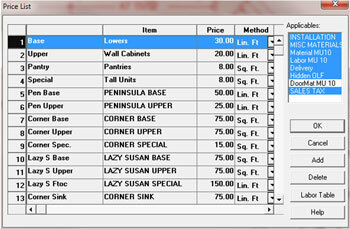 Apply Percentage to means the Percent amount will be assigned to Catalog Cabinets, the Material Cost or the Labor Cost. Apply to Percentage means that Profit, overhead etc will be charged to the value derived from the Markup/Discount percentage. Profit Overhead and Taxes are set up in the Profit/Overhead/Taxes section of Pricing. Subtotal Only means this markup/discount is figured on a room subtotal cost, (including the other room markups/discounts). The Hidden Price is a Markup/Discount that is filtered in with each line item, where applicable, but doesn’t show as a separate line item on the proposal. As you can see, the pricing is pulled together from many places. As such, it takes some consideration when setting up your files. Contact technical support or visit the esupport user forums for more details on the pricing routines. The pricing setup is valid for all Cabnetware Manufacturing versions (except Standard has no Catalog function).